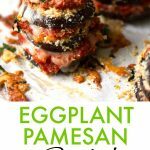 These Eggplant Parmesan Stacks are an architectural redesign of classic eggplant parmesan only healthier because the eggplant is baked, not fried. 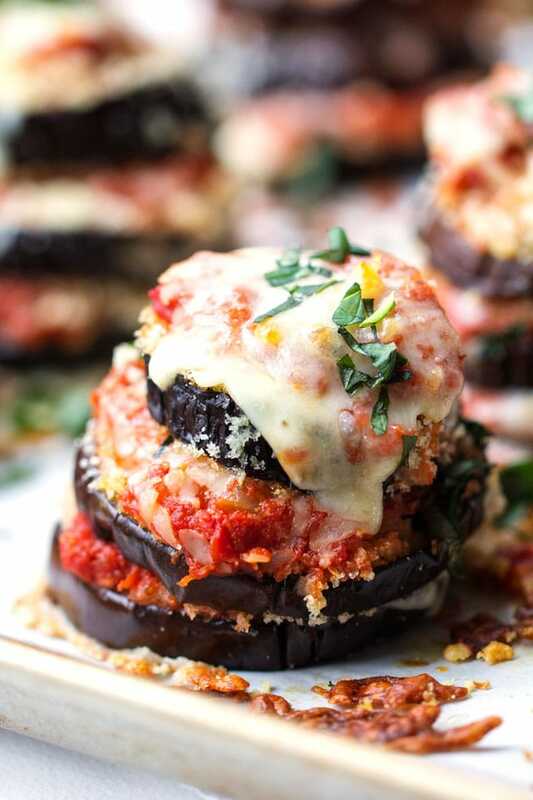 These scrumptious towers of eggplant parmigiana make a festive appetizer, lunch or dinner. The cooking theme on Fridays at my house is usually about what I can make that goes well with a cocktail. It’s the end of the week and we’re ready to give ourselves over to celebratory exhaustion. Dinner is casual to the point of not even sitting at the dinner table. It’s platters of appetizers and small bites out on the coffee table, so we can plop down on the couch and stay there. 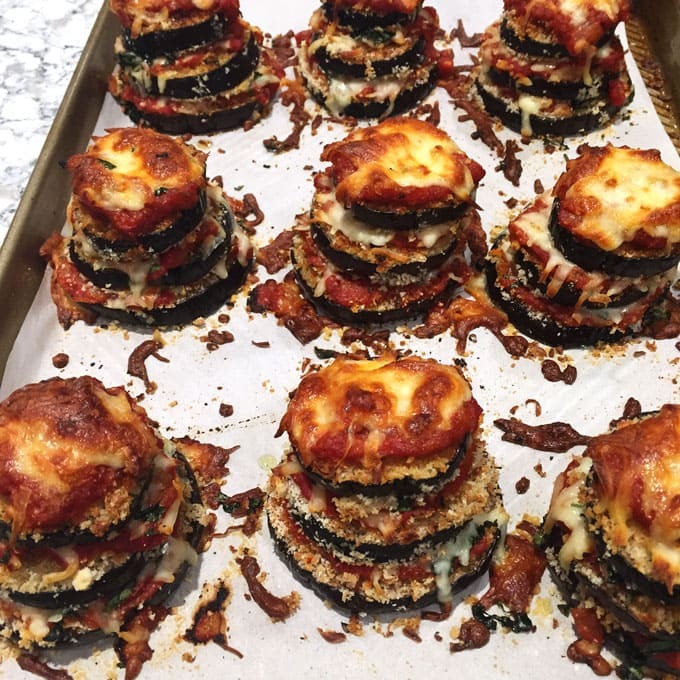 I concocted these eggplant parmesan stacks a couple of weeks ago for a Friday night, casual, on-the-couch dinner with friends. 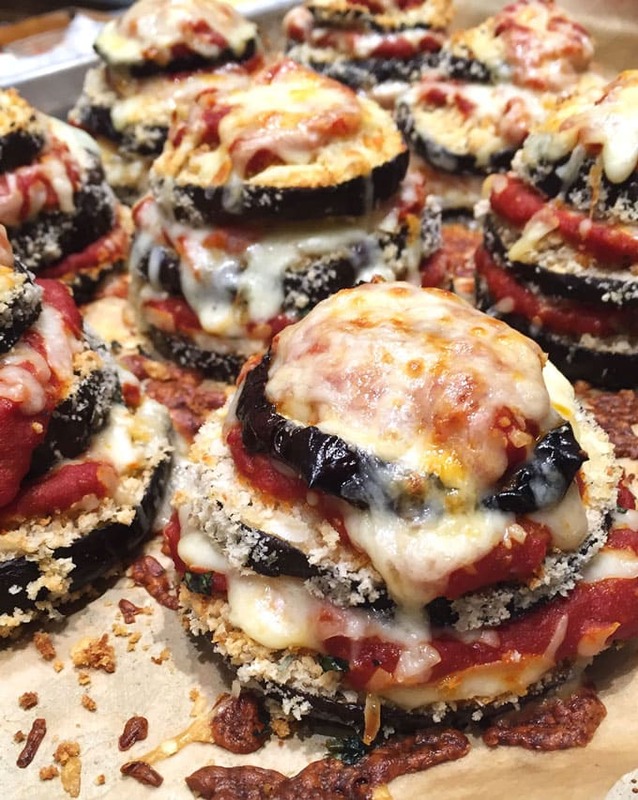 I wasn’t even planning to blog about them, but they were a “wow!” As soon as they came out of the oven, I took one look at these towers of breaded eggplant rounds, held together with layers of thick rich tomato sauce and melted cheese, and I decided I had to share the recipe with you. All I really did was change the architecture of one of my favorite comfort foods casseroles, keeping the flavors essentially the same. 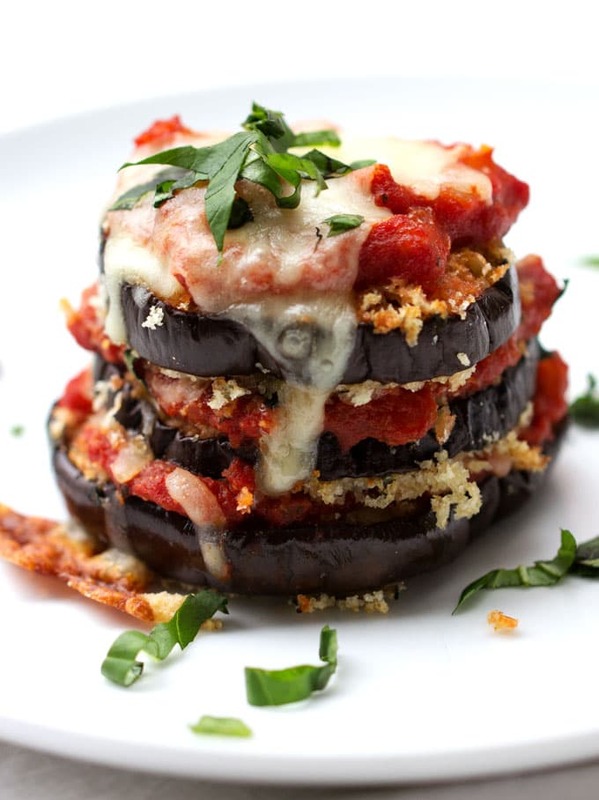 Vertical eggplant parmesan has a very different vibe from a casserole. They’re both delicious but the towers are very fun and festive, perfect for a celebratory occasion. Bread the eggplant by dipping it into milk and then crumbs. While the eggplant bakes, make the sauce. The sauce and the eggplant should be ready at about the same time. 20 minutes before dinner, put the stacks in the oven and bake. One stack per person is great for a starter or for a light supper with salad and bread on the side. Serve two stacks per person for a more filling dinner. These eggplant towers are so photogenic! I couldn’t stop taking pictures of them. 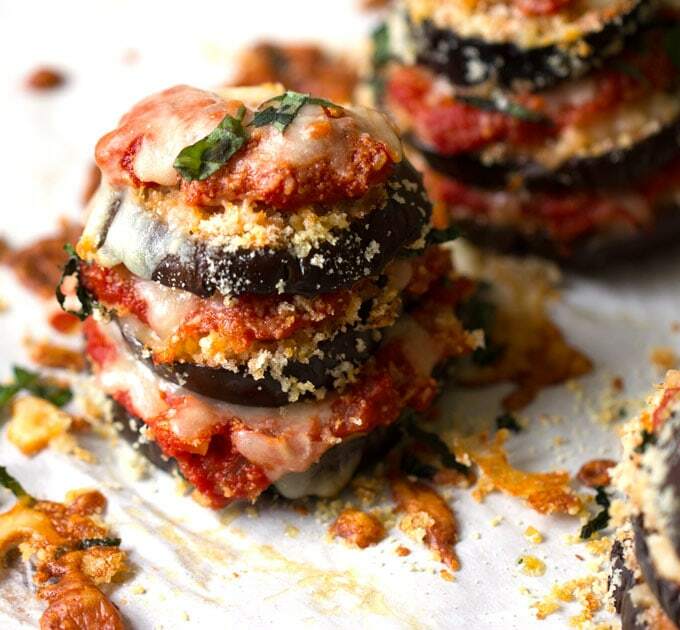 Here’s the recipe for Eggplant Parmesan Stacks. If you cook this recipe, I hope you’ll come back to leave a comment and a star rating. I’d love to know what you think. 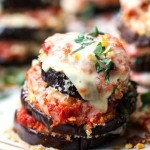 Baked eggplant, stacked up with tomato sauce and cheese. 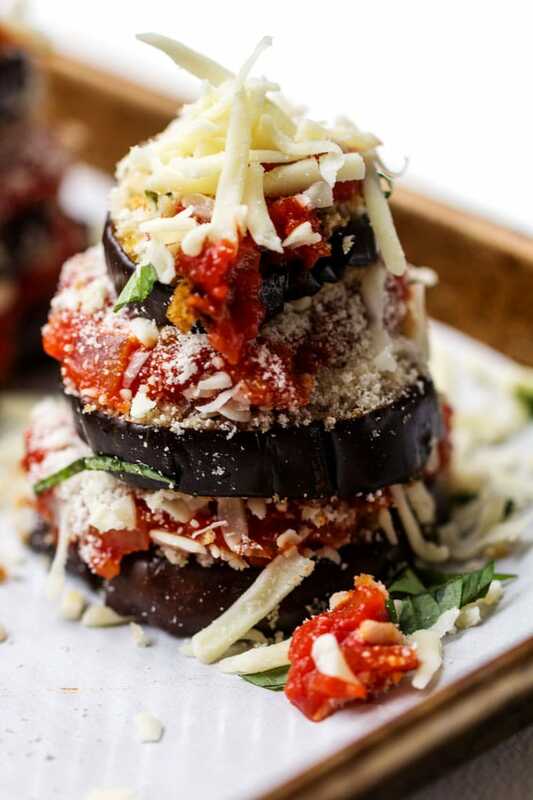 These towers of eggplant parmigiana make a festive appetizer, lunch or dinner. Make the Tomato Sauce: While the eggplant is baking, make the sauce: heat olive oil in a large cooking pot or dutch oven oven medium heat. Add chopped onion and cook for about 8 minutes until very soft and starting to brown. Stir in dried basil, salt, crushed tomatoes, tomato paste and honey. Cook sauce at a simmer, partially covered, for 20 minutes. Add minced garlic (if using) and simmer 10 minutes longer. Remove from heat. The sauce will be thick. Assemble the Stacks: Line a jellyroll pan with parchment paper. Divide the total number of eggplant slices by 3 and that’s how many stacks you’ll have. You should have enough for 8-9 stacks. Arrange the 8 (or 9) largest eggplant rounds on the prepared parchment-line pan. Top each round with two tablespoon of tomato sauce, a teaspoon of parmesan, 2 tablespoons of mozzarella, and a sprinkle of slivered basil (don’t add basil to the top of the stacks) Repeat with two more layers, using the larger slices for the middle layer and the smaller ones for the top. Bake for 20 minutes. Serve hot. Garnish each stack with a sprinkle of slivered basil. *Time saving tip: If you’re short on time, use a 32-ounce jar of your favorite tomato sauce for this recipe. Add a can of tomato paste to thicken it. A thick sauce is great glue for holding the stacks together. I just stumbled upon your website and I love it all! Cannot wait to try your recipes. I’m so glad to have you aboard! I hope you enjoy the recipes. Keep me posted!! I made these tonight. They taste as good as they look! I’m so glad you enjoyed them Carol. Aren’t they fun?! Traditional eggplant parm is great too but there’s something really special about the stacks. These not only look lovely but taste great too. I also added 1 fresh basil leave underneath each layer – recommended especially if you love the taste of basil like me. I’m so glad you enjoyed them Rachel, and I’m with you on the fresh basil – the more the better! This recipe is a delicious beauty. Perfect for your next vegetarian dinner party! Ok, you need more comments other than your husband 🙂 These look amazing and seem fairly simple. I am going to try them out next time I buy eggplants – Thank you!